A coalition of 40 media organizations, led by the Reporters Committee for Freedom of the Press, argued that a court order intended to protect minors interferes with the First Amendment rights of journalists. Cook County Juvenile Court Judge Patricia Martin issued an order that banned ProPublica Illinois and other media outlets from publishing information — which ProPublica Illinois had already obtained — that identifies the minors and their foster parents in a child welfare case, effectively constituting a prior restraint. The First Amendment significantly limits the ability of the government to impose prior restraints. 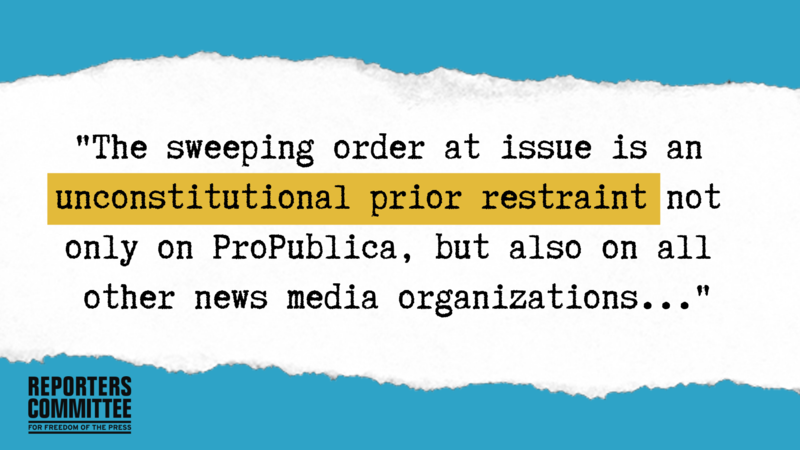 ProPublica Illinois filed a petition to intervene and oppose the ruling, and on April 3, the media coalition filed a friend-of-the-court letter in support of its efforts. ProPublica Illinois learned the minors’ names through what the media coalition calls “usual, lawful journalistic practices.” The friend-of-the-court letter said preventing the outlet from fully reporting on this welfare case could have a harmful effect on the public. Arguments on this court order are scheduled for April 5. View the letter.